Dr, Jacobs offers a full array of endodontic procedures to help you maintain healthy teeth. You can read more on this page about specific services. Root canal therapy is a way to save your natural teeth and prevent the need for dental implants or bridges. If you experience any of these symptoms, your dentist will most likely recommend endodontic treatment to eliminate the diseased pulp. This injured pulp is removed and the root canal system is thoroughly cleaned and sealed. This therapy usually involves local anesthesia and may be completed in one or more visits depending on the treatment required. With the appropriate care, your teeth that have had endodontic treatment will last as long as other natural teeth. Yet, a tooth that has received treatment may fail to heal or discomfort may continue to exist. Sometimes, the discomfort may occur months or years after treatment. If so, endodontic retreatment may be needed. Once retreatment has been selected as a solution to your problem, the doctor will reopen your tooth to gain access to the root canal filling material. This restorative material will be removed to enable access to the root canal. The doctor will now clean your canals and carefully examine the inside of the problematic tooth. Once cleaned, the doctors will fill and seal the canals and place a temporary filling in the tooth. Generally, a root canal is all that is needed to save teeth with an injured pulp from extraction. Occasionally, this non-surgical procedure will not be sufficient to heal the tooth and your endodontist will recommend surgery. Endodontic surgery can be used to locate fractures or hidden canals that do not appear on x-rays but still manifest discomfort in the tooth. Damaged root surfaces or the surrounding bone may also be treated with this procedure. The most common surgery used to save damaged teeth is an apicoectomy or root-end resection.An incision is made in the gum tissue to expose the bone and surrounding inflamed tissue. The damaged tissue is removed along with the end of the root tip. A root-end filling is placed to prevent reinfection of the root and the gum is sutured. The bone naturally heals around the root over a period of months restoring full function. Microsurgical techniques allow us to make a minimal incision and access to the root apex. The surgical operating microscope, providing both illumination and magnification, plays a central role in today’s success of apical surgery. Traumatic dental injuries can occur in children or adults. Whether the dental injury is a result of an auto-accident, a bad fall or sports related incident, it’s important to get care as soon as possible. Timely treatment is particularly important with dislodged or avulsed teeth. Internal bleaching is a technique that is used to whiten the appearance of endodontically treated teeth. The process for an internal bleaching involves the insertion of a bleaching agent into the tooth, which is left for up to two weeks, and then replaced until the tooth achieves the level of whiteness desired. Not everyone is a candidate for internal bleaching. The doctor will evaluate the degree of staining and discoloration that is present. Cone-beam computed tomography systems (CBCT) are a variation of traditional computed tomography (CT) systems. 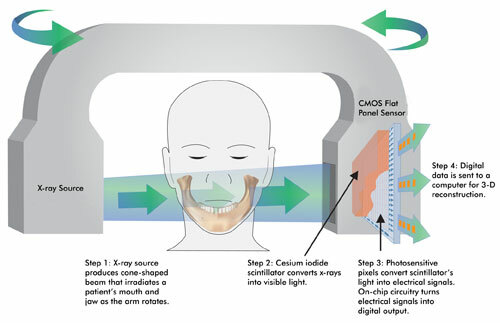 The CBCT systems used by dental professionals rotate around the patient, capturing data using a cone-shaped X-ray beam. These data are used to reconstruct a three-dimensional (3D) image of the following regions of the patient’s anatomy: dental (teeth); oral and maxillofacial region (mouth, jaw, and neck); and ears, nose, and throat (“ENT”). Dr. Jacobs has added Cone-Beam [CBCT] technology to further enhance her ability to diagnose her patients.